Here in the temperate zone most of our woody plants are deciduous; they drop their leaves seasonally. This poses a gardening challenge for those of us with large, shady yards because if the leaves are not removed from lawn areas and some garden areas the entire area begins converting back into a woodland. Without my intervention this would only take a few years, and in fact it was well on its way when team Phactor acquired this property. And so seasonally, with the aid of a very large leaf mulching vacuum, a rental bargain, leaf removal and relocation only takes a few weeks, or so it seems. Fortunately several gardens of woodland plants are ready to receive their annual mulching of leaves. This image shows a small section, about one-fourth, of the problem, with only a fraction of the leaf fall complete, and this is all behind a quite adequately large set of lawns and gardens surrounding our abode. This way the Phactor's scientific field work smoothly transitions into gardening field work, and not a moment is lost watching football or baseball. The sugar maple, a 110 foot tall giant, always looks a bit depressed this time of year. 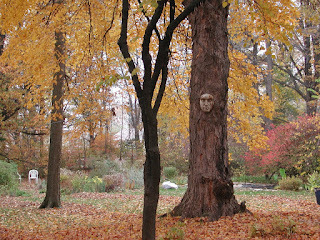 And what is that face on the maple? It's the tree's anthropomorphic personality by which we judge its moods.